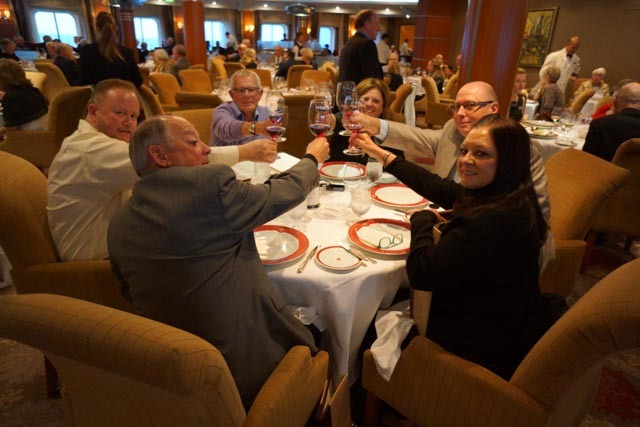 Earlier in the cruise I was thinking about how to get the most out of a dinner, and came up with the idea of arranging a progressive dinner. On the Mariner there are 4 restaurants, so four courses, and 5 bars, our journey tonight took us to each of the restaurants and to two of the bars, the other three bars are not exactly vibrant. 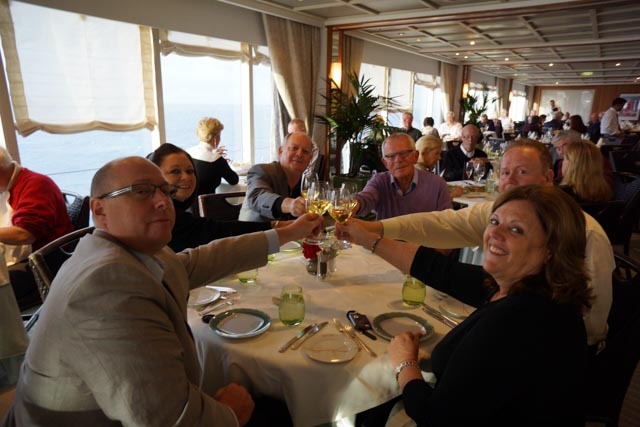 We believe that this was the first time that a progressive dinner had been arranged onboard the Mariner, it was pretty easy for us to organise as Gerry, with the help of the Maitre D’s, did all the hard work, including the selection of the wines. 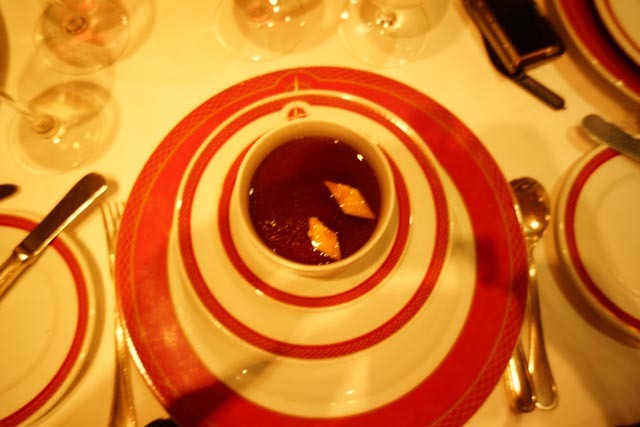 For those of you who are not familiar with a progressive dinner, the way it works is that you have one course in each location, in this case each of the restaurants onboard, progressing from one location to the next after each course. 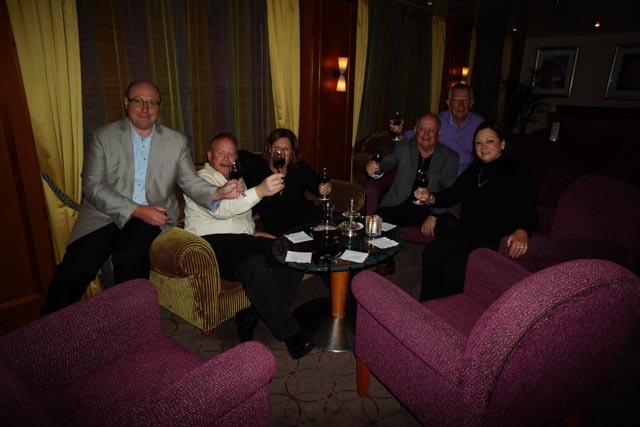 Our first stop was the Observation Lounge, which is on Deck 12 at the bow of the ship, for a pre-dinner drink. From the Observation Lounge we made the long journey to Sette Mari on Deck 11, Aft. On the way aft I noticed that the pool had been emptied, not sure why this was the case, but it was either for cleaning or as a safety precaution, possibly because of potentially rough weather ahead. It was time for a our first course, appertisers and a very nice bottle of 2008 Antonori Cervaro della Salla. An Italian style Chardonnay, a wine which is more complex and less buttery than most Australian or Nappa Valley Chardonnays, which I am not regular a fan of. 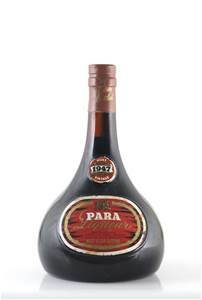 I would look for this again, the few years of age also enhanced the wine. Thanks to Gerry for picking this out! Appetisers in Sette Mari are traditional Italian Style, and a very good way to start of our Gastronomic Adventure through the ship. 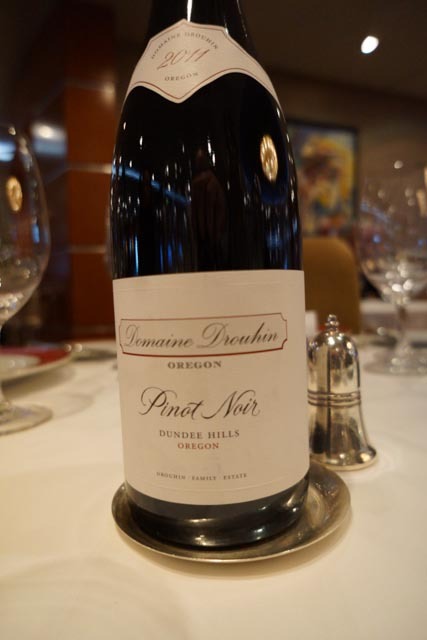 In Compass Rose Gerry had picked out a bottle of 2011 Domaine Drouhin Pinot Noir from Dundee Hills in Oregon for us. which was very enjoyable. The Pinot Noirs from Oregon are cool climate and well worth a try, this one is no exception, not as big as some of the Australian Pinot Noirs, everyone seemed to enjoy it. Would like to give this a few more years to see how it develops. For my soup I had the beef consume. 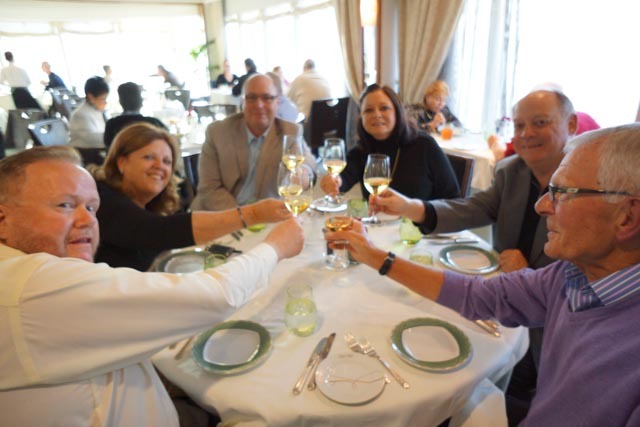 As we were about to leave Compass Rose, one of the Restaurant Managers freaked out as he thought we were leaving because we were unhappy with the meal, obviously he did not get the memo. Just shows how much the crew care about ensuring every guest enjoys themselves! Before the dinner we had to make a very difficult decision, where to have the main and dessert courses. Eric the Maitre ‘D of Signatures lobbied us for the dessert course and promised us that it would be special! 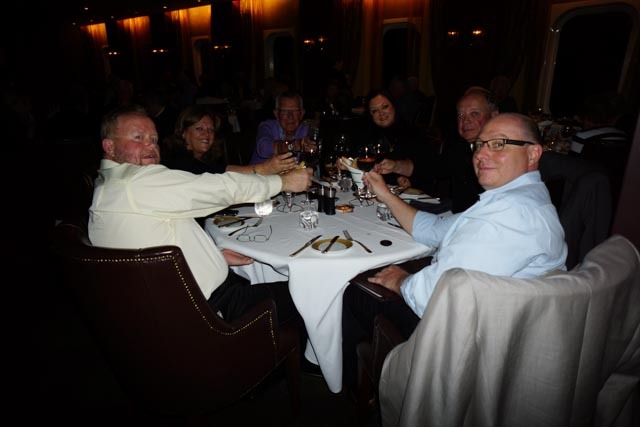 So we went with Prime 7 for the main course, which is next door to Compass Rose on deck 5. Now for the Main Course, and a Magnum of Prima. 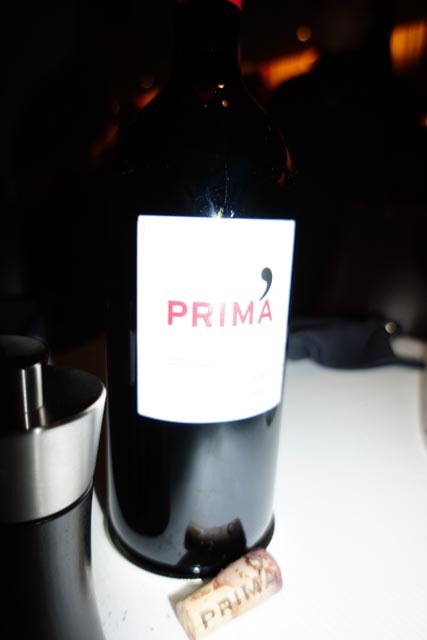 A Spanish Blend that was just the right wine for our Mains, this wine was picked by Don and decanted by Arthur. Prime 7 is known for its steaks and seafood, but tonight I decided to change things up a bit and had the pan-fried chicken, the looks from everyone else were priceless 🙂 Will have to have the chicken again, it was excellent. 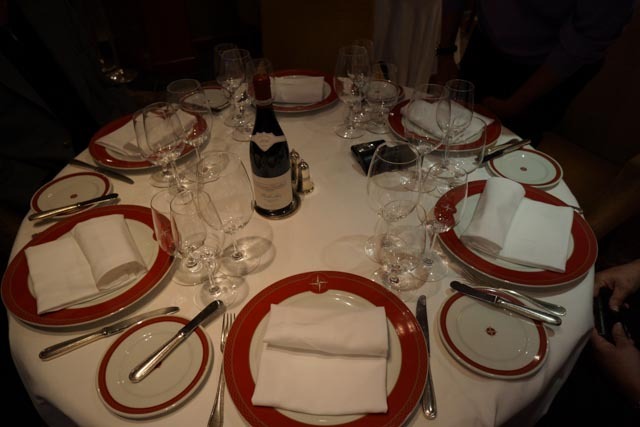 As usually happens when you are having a good time, you lose track of the time and forget to take pictures (maybe that was due to the wine), which was no different this time, so we were about 30 mins late when we arrived in Signatures, which is on deck 6 midships. Eric had told us that he would look after us with a special dessert, he was not wrong. 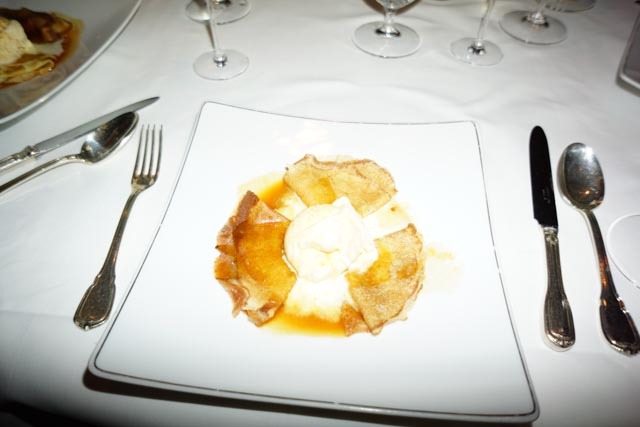 We crepe suzzette, unfortunately, due to safety concerns, it is not possible to cook them at the table, but they were still excellent. To accompany the dessert we had a bottle of dessert wine which Kathi had purchased from I think it was the Tabali winery which we visited whilst docked in Coquimbo. Unfortunately I forgot to take a picture of the bottle. Even though we had finished our dinner, the night was not over. We had one more location to visit and to finish off the night in style. 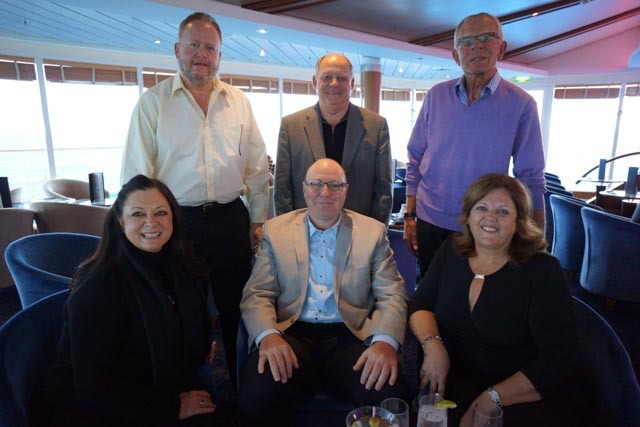 Next stop was the Horizon Bar, deck 6 aft, where Gerry had decanted a bottle of 1947 Seppelts Para Liqueur Port that I bought on the cruise. Gerry surprised us with by paring the Port with chocolate, the perfect match. I was a bit worried that the Port would not travel, as far as I know it had journeyed from Australia to Singapore to Lima by aircraft and then to the South Atlantic by ship. It was excellent, and just what was needed to ensure that we finished off a great night appropriately. We all made it to the end! 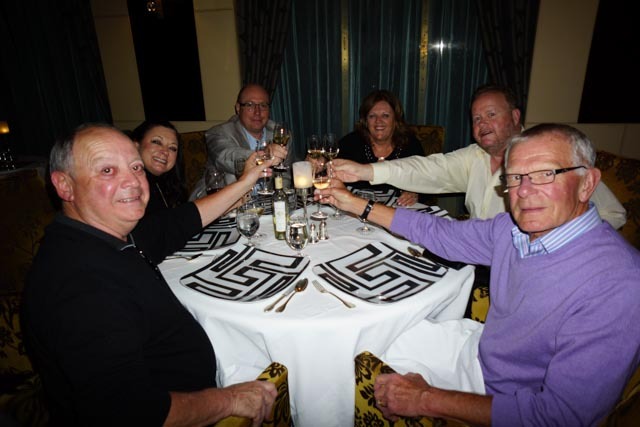 This night was only possible because of the help of the crew, especially Gerry and the Restaurant Maitre D’s. I am not sure if another Cruise Line would have made this a reality, let alone approved it!